The network TV advertising marketplace continues to defy the laws of physics, and apparently, rational supply-and-demand markets. 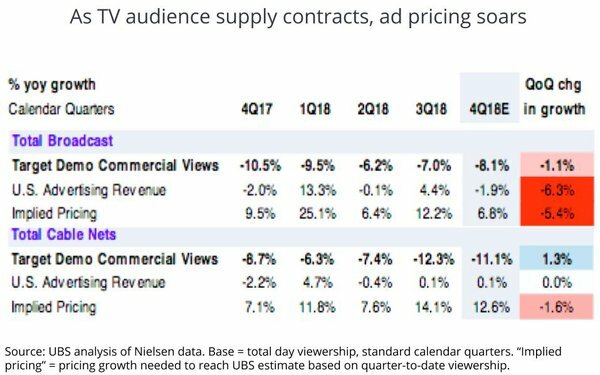 According to an analysis of quarterly audience, ad revenue and pricing data published this morning by the equities research team at UBS, the erosion of total day network audience delivery has been accelerating -- especially among cable networks -- but ad revenues have been relatively flat, implying a surge in average prices paid by TV advertisers. Looking at the most recent quarter-to-date, broadcast audience delivery has declined 8.1%, while ad revenues dipped 1.9%, leading to an implied hike in ad prices of 6.8%. Cable networks, meanwhile, have experienced an 11.1% erosion in audience delivery, a marginal 0.1% increase in revenue and a 12.6% surge in pricing.